£7353.10 raised so far for Dawgust! YIPPEE - IT'S HERE - DAWGUST HAS ARRIVED!!! Is your DAWG hound Irish? (tattoos in both ears). If yes, then the chances are they were saved by our very good friend, Eila Moloney. This year “DAWGUST” is raising funds for Eila to help her save even more hounds. Today we officially launch the 2017 “DAWGUST” challenge and we are off to a brilliant start following the weekend Snowdon climb (an amazing £1,386.32!!). There are many events and activities planned throughout the month, so please keep watching Facebook and our News Page. It is not too late to organise something if you want to contribute to this brilliant cause. However, you may just want to make a small donation, if so please click the link below. Last year we raised an amazing £7,875 which helped Eila save many dogs during the last twelve months. Many thanks to everyone who has donated and contributed towards DAWGUST, even before it was launched on today. There are several events planned during the month of DAWGUST, but if you just want to simply make a contribution then please donate via the link above. • 29th July - Team DAWG took on the Snowdon challenge. • 27th August Catherine and Lynette’s Dog Walk in Frampton - starts and ends at The Lamb Public House!!! It’s not too late to organise an event, i.e. coffee morning, dress down day at work, sponsored slim, no alcohol for a month, cake sale etc. If you need help please contact us. The trustees are very proud of all of our supporters throughout the year, but even more proud during DAWGUST where we raise money for another cause, which is very close to all of our hearts. If you have an Irish dog from DAWG – it is almost certain they will have been rescued by the wonderful Eila Moloney – here’s your chance to give something back! 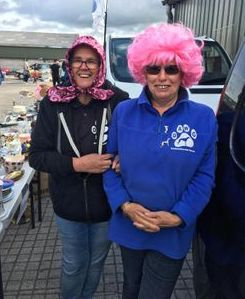 Thank you to Dave, Lynne, Barbara and the hounds who were flying the flag for Bristol DAWG today at the Nunney Street Fair - they raised an amazing £171.32. It was lovely of Hazel to pop along with Barney and Beanie. Lots of interest in the dogs, which can only be a good thing. Thank you all so much. Well done to everybody that attended the car boot sale at Washingpool Farm, Easter Compton this morning. As you can see from the photograph above, it was great fun and raised £350 for Dawgust! Probably one of Bristol DAWG's greatest success stories, Gerry is off this evening to complete the paperwork for Sassy and can't wait to see her in her new home with Jane, Martin and her new sister, Rosie the retriever. This little girl arrived with us back in January in terrible condition and it has been a very long road as she has all sorts of allergies, which are ongoing. We must say a massive "thank you" to Ann and Barry who have nursed this sweet girl back to health and to Animal Health Centre in Horfield who have provided excellent care during the last seven months. Sassy you have touched the hearts of many people and we know you will never feel pain again as your new family adore you. Thank you Jane and Martin. Lily will be making her way over the Irish Sea early this morning in search of new beginnings. Thank you Eila for saving her and thank you Kristie Davies and husband James for getting up in the early hours to take her in. Gerry and Amber spent a lovely half hour this morning at BBC Radio Bristol with Steve Yabsley who very kindly invited them on to his show. Gerry managed to give lots of information about Bristol DAWG, together with forthcoming events. Thank you for inviting them Steve, it was a shame Amber went to sleep and ignored you - typical greyhound!!! Thank you to Jacqui Betts for giving the very sweet Thunder (now renamed Scout) a forever home. 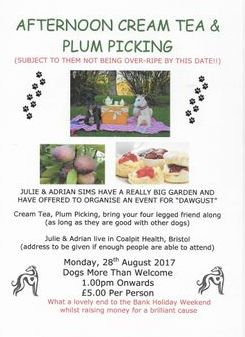 Jacqui very sadly lost Newt following a short illness, Newt was also a Bristol DAWG dog, he was a very handsome black boy with lots of white flecks. We know Scout will have a fabulous home with you Jacqui, thank you for giving her another chance in life. 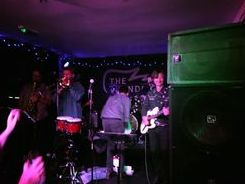 "Excellent band with a brilliant repertoire. I was arguably the oldest person in the room, but there were plenty of songs that I was familiar with as well as lots of more modern stuff that I enjoyed." 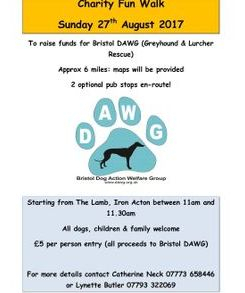 Bristol DAWG will be receiving a donation of £200, it was always intended that this money would go into the Dawgust fund as Gavin and Chloe have an Eila Dog. Well done DAWGers for supporting the evening so well. Massive thank you to Jane Boden who has given Nano his forever home. 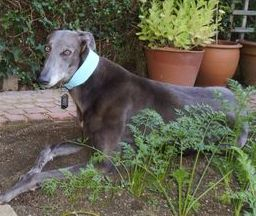 Jane initially fostered Figgy, also a Galgo from Spain, and, surprise, surprise, she quickly became a "failed fosterer". Jane then decided to foster Nano and, you will see a pattern here, she has once again become a failed fosterer!! We are so grateful to Jane as both Nano and Ice arrived from Spain with a bad skin infection which required weeks of being bathed - thank you Kristie Davies at Tonew for the boys baths - so, until things started to improve they couldn't be re-homed. Jane has very kindly continued with Nano's weekly baths, so it has been quite hard work. Ice, whose skin condition was much worse, is now looking for a foster or forever home, please see details on HERE. Thanks to Dave, Lynne, Barbara, Immy (pictured above), Karma and Spirit who had a stall at Corsley and raised more than £200 for Dawgust. Well done all of you. Still lots of bargains on the Charity Auction, if you haven't joined the group it's not too late. All proceeds to "Dawgust". Massive "thank you" to Catherine Neck and Lynette Butler for organising the dog walk today for "DAWGUST". Provisional figure raised so far is around £380, which is absolutely amazing. It was lovely to see so many DAWG dogs and their owners, plus lots of new faces that came along and supported the cause. Thank you to Justin for very kindly selling raffle tickets and and "guess how many dog biscuits in the jar". Thanks to Derrick who was on hand with a car just in case any dogs/humans struggled - think you thought of everything Catherine and Lynette, brilliantly organised. The pubs had some lovely shady spots, and a lot of the walk was in shade - so well planned. Brilliant news our very pretty Annie has gone to her forever home in Stroud, Glos. 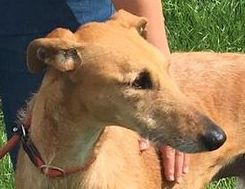 Annie has fallen on all four paws with Michelle Salter who is a previous greyhound owner and we know she will have a lovely life. Another brilliant afternoon today with even more money raised for "Dawgust". 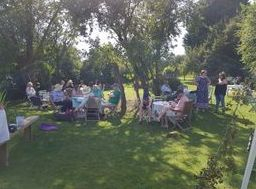 Massive thanks to Julie and Adrian Sims for a fabulous afternoon with Cream Tea and Plum Picking at their home. Thank you also to Julie's friends who did an amazing job throughout the afternoon. What a lovely way to end the bank holiday in a beautiful setting, enjoyed by lots of dogs and humans - all the dogs were so well behaved. An amazing £670 was raised - Smoke The Bloke and Pearl The Girl were perfect hosts!!! 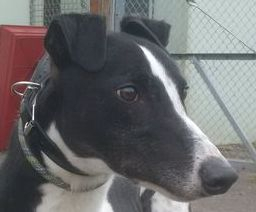 Gerry spent a lovely hour with Ginny this morning to complete the paperwork for the very handsome Star, now renamed Nero. 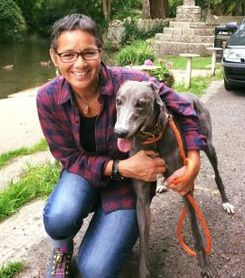 Ginny sadly lost her greyhound recently and decided it was time to give another dog a home. Nero hasn't put a paw wrong, in fact it was like he had always been with Ginny - he found the sofa very quickly!! Thank you Ginny for giving Nero a wonderful new home. Last day of "Dawgust" - it's not too late to donate. Every penny counts. 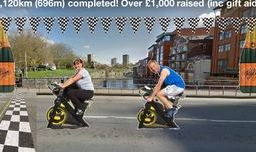 With money pledged so far the fund stands at £7,353.10 (including Marcus & Claire's ongoing bike ride). The Charity Auction is still open until Saturday evening and has raised a further circa £1,300 to date - lots of lovely items still to bid on. The Quiz Evening is still to come on the 23rd September (sorry only date we could get), and although not in August the proceeds from the evening will still be added to "DAWGUST" - and remember Colin will double whatever is made on the evening. Well, after 31 days of cycling with not a single puncture to report, Claire and Marcus have done it! 1,120 km cycled and over £1,000 (incl. Gift Aid) raised. Having started in Cork all those days ago and travelled through Southern Ireland, across the Irish Sea, through South Wales and over the Severn crossing (all tolls paid) we finally finished on Bristol Bridge this afternoon (so good of the council to erect a bit of bunting for us - now we know where council tax goes!). Thanks to everyone that's donated in support, it's been very much appreciated.